Tottenham defender Serge Aurier almost completed a move to Spain with Atletico Madrid before the English transfer deadline last Thursday. Aurier has only spent one year in North London with Spurs after moving from Paris Saint Germain last summer, but he made a strong impression on the squad and competed admirably with Kieran Trippier for the right-back slot in Mauricio Pochettino’s starting XI. The 25-year-old spent two seasons with the perennial French champions in Ligue 1, ultimately failing to hold down a regular place in the team before switching to the Premier League in a £23m pound deal in 2017 – as per Talk Sport – and it seems he is now in exactly the same situation at Tottenham. 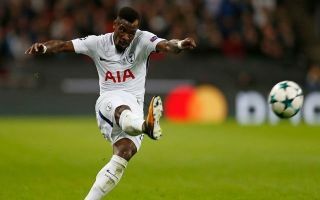 His current standing in the pecking order at the club could be one of the reasons why, according to RMC Sport, he has been the subject of interest from Borussia Dortmund and Atletico Madrid, with the latter aiming to bring him in after making contact with Spurs representatives early in the transfer window. RMC Sport reports that a deal between the two clubs collapsed at the last minute, which means Aurier now has no choice but to stay and fight for a place in Pochettino’s ongoing plans for the new season. The Ivory Coast international actually played the full ninety minutes of Tottenham’s opening victory of the new season against Newcastle United on Saturday and with Kieran Trippier still on the comeback trail after an extended break, he may get plenty more opportunities to prove himself in the coming weeks. The Spanish transfer window remains open until the end of August but it now seems unlikely that Atletico will re-open negotiations with Aurier, particularly after his promising start to the 2018-19 Premier League year.